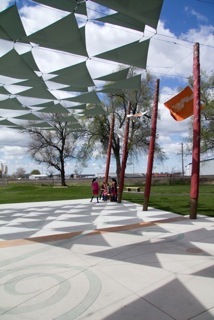 The design for the Alberta City Gathering Place in Tuscaloosa, Ala: a covered amphitheater, utilizing I-beams, salvaged wood and concrete slabs left from a devastating tornado on April 27, 2011. In June, hundreds of volunteers from Tuscaloosa will work together to build this new neighborhood focal point. Milenko Matanovic is a self-described recovering artist whose Pomegranate Center in Issaquah, Wash., is using collaboration to transform communities nationwide. In the PopTech video, Matanovic describes the tension that inevitably arises in any collaboration between pragmatism and idealism — between the people in the room who want to focus on what’s doable, and others who want to focus, instead, on articulating a full-bodied vision of what should be done. As someone who’s managed a number of collaborative projects, this observation rang true, and I wondered — what does the Pomegranate Center do to resolve, or at least negotiate, this tension? 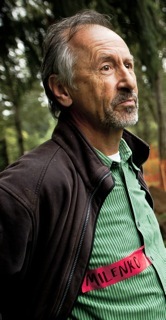 The key to resolving this and other tensions, Matanovic said, is to establish clear ground rules for discussion that steer the group toward active problem-solving, and away from simply advocating pre-existing positions. 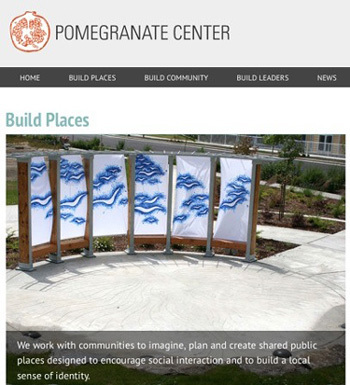 Screenshot of the Pomegranate Center’s homepage. The real success, Matonovic said, is when the group takes responsibility for their code of conduct, encouraging each other to be constructive and creative. Facilitators also need to ask questions that steer discussion in a constructive direction. For example, at the first community meeting in Tuscaloosa, each of the approximately 60 attendees started out promoting that the planned project should be built in their own neighborhoods. The facilitator quickly intervened, asking, “If the project wasn’t built in your neighborhood — then what neighborhood should it be built in?” Matanovic remembers how in that instant, a woman who had been advocating her neighborhood suddenly shifted gears, naming a lower income neighborhood as the best location for the project. Others quickly followed suit. This emphasis on action and results is key to the Pomegranate formula. People are tired of attending endless meetings without seeing results, Matanovic said, noting that everywhere he travels, people seem to be getting skeptical about the idea of visioning; too often, they’ve been asked what they think, without evidence that anything happens with their input. This, he said, does not bode well for participatory democracy; people need to feel good about participating, and they need to know that their input matters. “That’s why we move very succinctly through our process,” Matanovic explained, with a limit of three to four meetings maximum per community. “Most talented people will disappear after two to three meetings,” he said. That’s enough time to arrive at the “essence of a vision,” at which point Pomegranate staff can begin the design process, based on a community’s vision. The possibilities of an empty stage. In Tuscaloosa, the visioning meetings — which began in early December — are over, and the design process is coming to a close. Now, the center is waiting to get the permits it needs to begin building; some grading is planned, along with some work on the site’s concrete foundation. 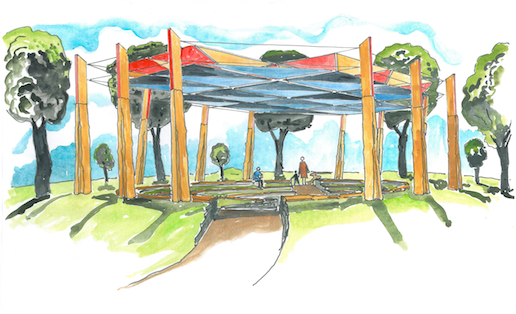 Then, for 10 days in June, a mix of local volunteers and volunteers from the center and its funder, Tully Coffee, will build a gathering place for the community, complete with an amphitheater, two picnic shelters, gateways, a new path, handcrafted banners and tiles. Making invisible ideas, visible, by bringing people together — isn’t that ultimately what all collaboration is about? How can news organizations apply the Pomegranate Center’s model? Are there ideas here that we can apply to our work with citizens and communities as we shape products and services to meet their needs? What about collaborations between news orgs — how can we honor that mix of “teamwork and individual virtuosity” that Matanovic describes? Share your ideas using the comments feature below. Amanda Hirsch is the editor of Collaboration Central. She is a writer, online media consultant and performer who lives in Brooklyn, N.Y. The former editorial director of PBS.org, she blogs at amandahirsch.com spends way too much time on Twitter. 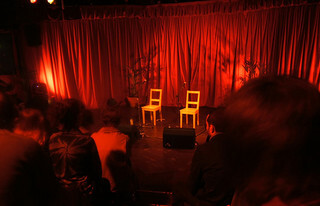 Photos courtesy of the Pomegranate Center, except for the photo of an empty stage, which is courtesy of Flickr user Simon Scott.